Could things get any worse for our alternate universe Yankees after a 1-6 week in the previous installment? Well, sure, they could lose out in this week’s edition. You can probably gather from the headline that this week wasn’t quite as bad, though. What’s on the slate this time around? An off day and two series vs. Boston and Oakland at home. The off day on Monday gave the entire pitching staff a full rest (obviously), so the need for an eight-man bullpen no longer existed. Jonathan Holder was optioned, and the now healthy Clint Frazier was promoted. With Brett Gardner on the disabled list and Jacoby Ellsbury scuffling, Frazier has an opportunity to show his merits. Things are much different in this OOTP universe. Both the Yankees (18-18) and Red Sox (16-19) are not doing too hot, unlike their real-life counterparts which are the best teams in the league. 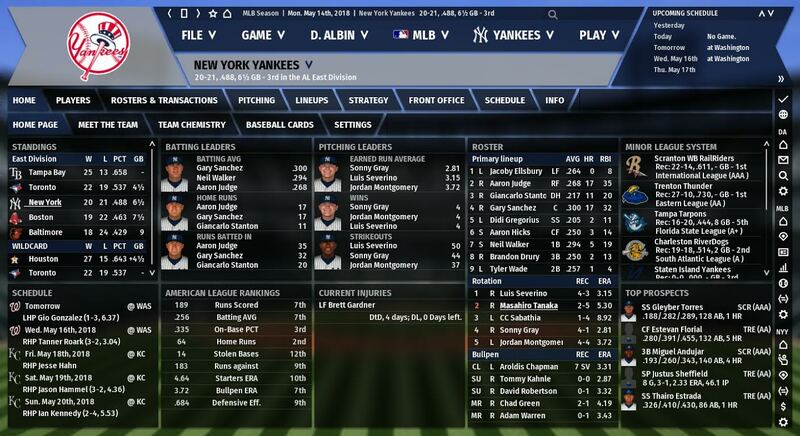 Further unlike real life, the Yankees did not fare well when hosting Boston this past week. Let’s get to game one. Of course, right after subtracting a reliever from the bullpen, Masahiro Tanaka was pulled before recording an out in the fifth inning, leaving runners on the corners for Adam Warren. Tanaka allowed four runs (including the two inherited by Warren). Meanwhile, Eduardo Rodriguez was dealing and had allowed merely two runs through six innings. He finally ran into trouble in the seventh with Boston up 5-2 at the time. Clint Frazier, in his season debut, made it a one-run game with a two-run homer. After that, the Red Sox bullpen shut the door: Joe Kelly pitched two clean frames and Craig Kimbrel closed it out. The final was 5-4, and it dropped the Yankees one game under .500. In the middle game of the series, things were looking up. CC Sabathia was pitching well and Aaron Judge had blasted a three-run jack in the third. Fast forward to the fifth, when the Yanks were up 3-1. That’s when things started to look down. Boston hit two homers against Sabathia in the inning (Rafael Devers and JD Martinez) to gain a 4-3 lead. Sabathia did pitch one more inning, but it was a shame that what was looking like his first good start of the year was so quickly ruined (his ERA now sits at 8.92). If he doesn’t turn it around in his next start or two, Sabathia might lose his spot in the rotation. To make matters worse, Porcello went unblemished other than the Judge bomb, and the Boston bullpen closed it out again for a 5-3 win. The Yankees salvaged the third game to avoid the sweep, but the bullpen certainly tried to give this one back to Boston. Up 6-3 in the seventh, it was time for the bullpen formula to get the Yankees back in the win column. Instead, Tommy Kahnle coughed up the lead to make it 6-all after seven. JD Martinez delivered the big blow, a two-run dinger. It didn’t take long for the Bombers to regain the lead, as Aaron Judge’s solo homer off Tyler Thornburg made it 7-6 in the seventh inning. Yet, David Robertson couldn’t hold onto the lead either. With runners on the corners and two outs in the eighth, Robertson’s pickoff throw to first went awry and allowed the Red Sox to even the score again. The game would remain 7-7 until the tenth inning when Neil Walker’s RBI single was a walk-off winner. The win was a big sigh of relief considering how poor last week and the first two games of this series went. Entering a series that welcomed the Athletics to New York, the virtual Yankees had lost eight of its last ten ballgames. Eek. Fortunately, the Yanks had a much-needed laugher in the series opener. Aaron Judge (twice), Tyler Austin, and Gary Sanchez hit home runs in a 10-1 victory. 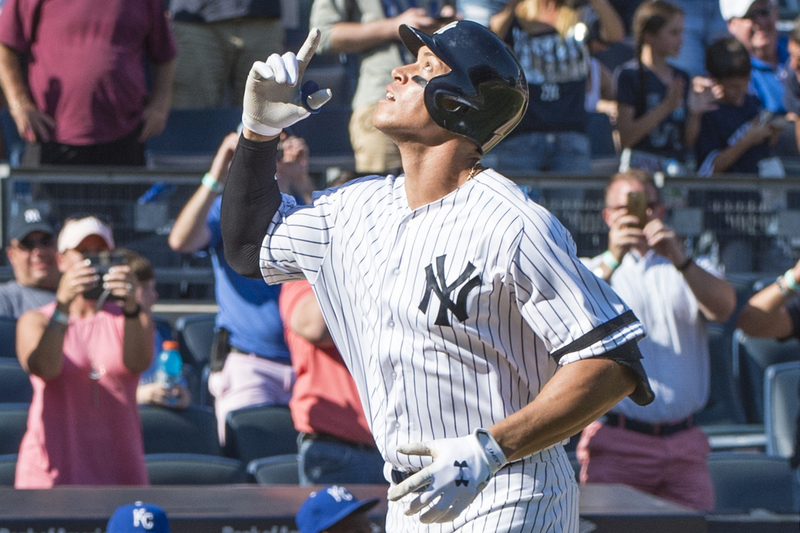 Judge and Sanchez are now tied with 17 homers, which leads the league. Despite all of the offense, this game’s story was Jordan Montgomery. The tall lefty was one out away from a complete game shutout but was pulled with 112 pitches after a Chad Pinder RBI double. Chasen Shreve recorded the final out. Montgomery’s final line was impressive: in eight and two-thirds, he struck out nine and didn’t walk a batter while giving up seven hits and one run. He sure is healthy in our virtual OOTP world. After the offense was alive and kicking in the first game of the weekend series, it was dead on arrival of game two. Andrew Triggs, Emilio Pagan, and Blake Treinen combined to blank the Yankees en route to a 4-0 win. Luis Severino pitched well, allowing only two runs in seven innings, but it was no matter. The bats couldn’t do a thing against Oakland’s pitching. The final game of the series was postponed due to rain. If you were wondering why the header of this section mentioned a split, well, now you know. AL East: The Rays have been the league’s biggest surprise and are 25-13 and have a comfortable 4.5 game advantage over the second place Blue Jays. Chris Archer has been brilliant to lead Tampa Bay. The right-handed starter owns a 1.99 ERA in eight starts and 49.2 innings. Offensively, Wilson Ramos (11 homers) and CJ Cron (8 homers) have led the way. The Yankees and Red Sox are certainly the better squads, but Tampa Bay has built up some early season cushion. AL Central: Minnesota is 25-15 and holds a 4.5 game lead ahead of rival Cleveland. Ervin Sanatana has been masterful with a microscopic 1.32 ERA in 42 innings. Fernando Rodney has been lights out in the ‘pen. He has 10 saves and a 0.84 ERA. The offense has been an all-around powerhouse led by Max Kepler (153 OPS+) and Brian Dozier (135 OPS+). The Indians have yet to get going but are healthy, so they are in good position to not fall out of it. AL West: Baseball’s best record resides in the AL West, and it’s not the Astros. Rather, the 27-14 Angels have been the cream of the crop. Mike Trout is doing Mike Trout things (193 OPS+ and AL-best 2.8 WAR). The starting rotation has been brilliant, with Tyler Skaggs, Matt Shoemaker, and Andrew Heaney boasted sub-3 ERAs. Shohei Ohtani has the highest ERA of the bunch, but it’s still quite good: 3.53. Garret Richards has been sidelined with elbow soreness, but the rest of the staff has done the job. The Astros are right on the Angels’ tail at 27-15 despite Carlos Correa’s (back) and George Springer’s (wrist) injuries. NL East: At 23-17, the Mets are the division leaders. It’s a tad surprising considering that both Noah Syndergaard and Jacob deGrom own ERAs north of 4.40. Rather, it’s Matt Harvey (2.15 ERA – yes he’s still with the team) and Steven Matz (2.61 ERA) that have done the job. The Braves are in second (1.5 GB) and like in real life, appear to be there to stay. Ozzie Albies, Freddie Freeman, and Ronald Acuna are looking like a dangerous trio in OOTP. The Phillies are holding their own at 20-20, but have only had new acquisition Jake Arrieta for two starts. He’s out with an “unknown” injury. The division favorites, the Nationals, are 20-22. The problems have been an injured Stephen Strasburg, a good but not great Bryce Harper (123 OPS+), and a terrible Gio Gonzalez (6.37 ERA). NL Central: It’s looking like a two-team race between the Cubs and Cardinals, as the Brewers, Pirates, and Reds are all at least thirteen games under .500. The Cubs are currently on top at 26-14 thanks to its high octane offense. Ian Happ has been the star (193 OPS+), but Kris Bryant (10), Anthony Rizzo (8), and Kyle Schwarber (8) have hit home runs aplenty. Yu Darvish has proven to be an excellent acquisition and has a 2.78 ERA in nine starts. St. Louis sits only 2.5 games behind Chicago. There haven’t really been any major standouts for the Redbirds, though Marcell Ozuna does have 11 long balls. NL West: The Dodgers are healthy and roaring in OOTP, but they don’t hold the division’s best record. That belongs to the 26-15 Rockies, who are riding an incredible start by Nolan Arenado. The third baseman leads the league in WAR (3.1) and his hitting .342/.413/.739 with 17 home runs (193 OPS+). At 25-15, the Dodgers have been lead by its usual suspects: Clayton Kershaw, Corey Seager, and Cody Bellinger. If only those first two were healthy in real life. The Diamondbacks are the third team in the race at 22-18, mainly thanks to Paul Goldschmidt’s .363/.454/.669 (2.8 WAR) performance. Ohtani’s hitting: In 103 plate appearances, Ohtani has been a tad below average. He has a 92 OPS+ on a .227/.317/.398 triple-slash, but does have four homers. He’s also stolen 5 bases. Miguel Cabrera’s Renaissance: After a replacement-level 2017, Miggy has returned with a vengeance. He’s hitting .354/.422/.544 (156 OPS+) and has 1.8 WAR. He’s kept the Tigers afloat at 20-21. Billy Hamilton chasing Rickey Henderson: Despite a .279 OBP, Hamilton has 28 steals in 31 attempts in 41 games. Perhaps Henderson’s 130 single-season record is in jeopardy. The Yankees salvaged the final game of a three-game series against the Red Sox and avoided a sweep to start the week. It was a fortunate result, as they won in extras after the bullpen blew two leads. It might have been time to panic if they got swept after a 1-6 record last week. In the next series, the Yankees and A’s split two games before a Sunday rainout. Despite a crummy 2-3 week, the Yankees managed to gain one game on the first place Rays.